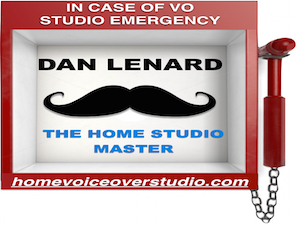 Seems many voice talents have been experiencing those "neighborhood noises” we have so little control over, and shouting their anguish from the top of their lungs. Stop that! You’ll hurt yourself. There are some solutions. I, too, had issues with the landscaping people mowing the grass around our condos and stopping me from the ability to record or do an ISDN session in peace. This can really be a pain-in-the-a** for our clients and our professionalism. If you are able, move your studio to the in-ground basement. Those cute little windows can be stuffed with insulation, old coats, unwanted neighbors, etc., to cut out that peripheral noise. Aim for a corner of the basement that is closest to the deadest area of your outside lawn. Perhaps a rock garden or pool - wait a minute – now you have to worry about the pool pump. But don’t forget the sump pump if you have one. AND … if you’re in a flood plain, you might re-think the basement idea altogether. My home studio is on our second floor in the front. Believe me, it’s not a moveable item. I have two windows that face the north and west. They’re the standard 35” x 60” sized bedroom window. When the landscaping company we hired mows the grass, and edges and blows the grass clippings, that noise is definitely a problem for me. This noise comes to the grass below my window, across our street and around our retention pond, "Lake Eller,” on any given grass day each week during the summer. So I contacted the folks at Auralex and they suggested that I measure my window openings for their Window Plugs (my term, and I think theirs now, too). I received two 2½-inch thick blocks of dense Auralex with a quarter-inch piece of what appears to be masonite on the outer window side. They fit perfectly to my window due to the custom measurements I gave them. When all is good, they sit off to the side in my studio, absorbing extra noise in my room. However, on Grass Day, as soon as I hear them coming, I simply close my blinds and take the window plugs and push it into the window opening that sits flush with my walls. The lowest frequencies from the mowers still are audible to my ears, but clients on the other end don’t seem to hear it as well as I. However, the general noise is cut out well enough to proceed and make the investment worthwhile. Call Auralex (see contact info below) and speak to one of their engineers and explain what you need. They are very willing and quite capable to handle this situation. I love how they embraced my situation and came up with this answer. As you can see by the pictures of my studio, I believe in the Auralex product line. I don’t own any stock, just a happy customer who has had great luck with the sound of my room compared to the DIY baffles that hung on the walls of my first studio. They kinda worked. But when you walk into my studio now, you know immediately that you are in an acoustically dampened room that sounds like it was made just for me. 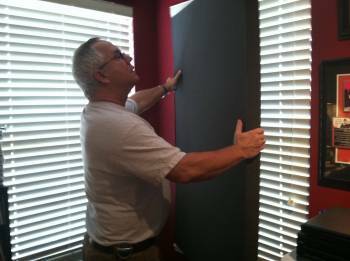 Auralex Acoustics offers a wide variety of standard soundproofing products, which you can review here. 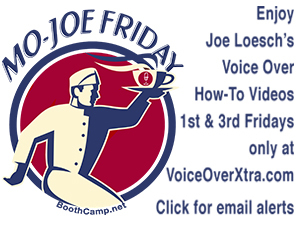 Johnny George is a versatile and engaging 35+ year veteran voice actor with an ISDN-equipped Pro Tools studio. 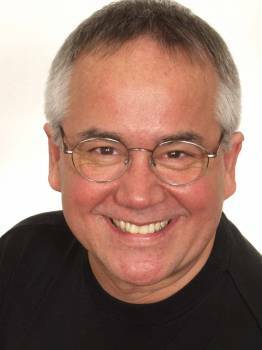 He specializes in creative audio for commercial, business marketing and multimedia applications. The joys of a home studio! We moved house to gain quiet, but didn't anticipate a BOILER lurking in the loft, spreading noise throughout the pipework. So I switch it off... but now there's this new noise ... "Howard! The bath's running cold!" Now, how to deal with that? Thanks for the kind words, everyone. I forgot to mention I have thermal-pane windows also in all of our condo for insulation of weather and helpful for sound. Note to Joel: The only reason I mentioned the brand name is due to the composition of the foam. They could give you more specific info at Auralex, but i think the composition of the foam has a lot to do with the specific frequencies it can squelch too. Please note...I'm not the expert. Yes on the plugs! 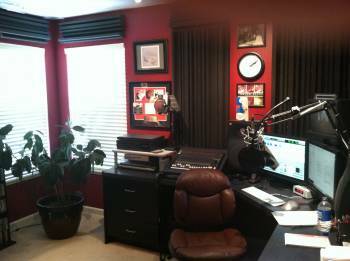 Before I built my bunker of an audio booth in another building on the property, I had plugs in my windows in my converted bedroom studio in the house. My husband made them of 4" thick dense foam glued to 3/4" plywood and attached handles to the plywood to help put them in and pull them out. They helped a great deal! And it got to where I just left them in all the time because I was so busy. Almost nothing, even my 12" thick double walls, keeps out all the low noise, but they helped me do ISDN sessions in my original studio with a lot less worry! Great article, Johnny! Thank you for this. I found that acoustic foam on the room side, AND a thin piece of foam on window side as well (on the other side of the masonite), created a snugger fit, and blocked more noise. Also, I put handles on mine, because my window is above a desk, and it's easier to manage the bulk and weight of this baffle with handles. Outstanding! My retired neighbors and their tinkering in the garage drive me nuts. I am totally contacting Auralex today about this. Thanks Johnny! Great suggestion, Johnny. I've also installed dual-pane vinyl replacement windows throughout my house, plus accordion-style window shades which have helped greatly. I like the plugs concept for the especially noisy days. It sounds like something 1/4" or 1/2" MDF and Corning's SelectSound Acoustic blanket would work for (if you're the handy type). Luckily (?) my landlord's groundskeeper is a little lazy and only mows once every other week, so I have been able to (so far) defer work on that day until after they are done. I did think about building something like these when I still living in NYC. Good to know they help. Thanks for a great article, Johnny! 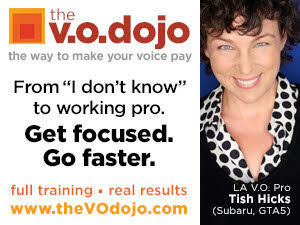 Simple, practical advice for a modern dilemma shared by many of us working from home. Many Thanks, John and Johnny!